LX910e Colour Label and Tag inkjet 8.25” wide Printer is the fastest and highest print quality colour label printer allows you to print your own high resolution high quality labels. Print your own labels in-house and on-demand as required prodives giving you complete control for all your label requirements. Saves time and alot of money ! LX910e is Primera’s fastest-ever desktop colour label printer. It can handle labels as wide as 21 cm (8.25”) and as small as 19 mm (0.75”). This latest addition can print a 10.16 cm x 7.62 cm (4” x 3”) label with 50 % coverage in just three seconds. In addition, ink costs are the lowest ever from Primera. This is due to a new, ultra-high capacity ink cartridge. • Print Speed: best-in-class throughput at up to 11.4 cm (4.5”) per second. • Print Quality: horizontal banding is a common problem with many lower-cost desktop colour label printers. Not so on LX910e. Banding is virtually eliminated – even on the faster print speeds. • Interchangeable Dye or Pigment Inks: with a simple swap-out of ink cartridges, LX910e can print with dye-based ink for brilliant, eye-popping colour. Or, choose pigment ink for maximum durability against water and UV light. Both types of ink work interchangeably on the same printer. • Single Ink SKU: LX910e utilizes an all-new, ultra-high capacity single CMY ink tank. You’ll only need to replace and keep on-hand one ink tank instead of two or four. This keeps your inventory simple and makes ink swaps fast and easy. Process black is dark and crisp. Best of all, process black uses no more ink than a separate black ink tank would for printing the same amount of text or graphics. • Metal Case: LX910e has a tough, steel case with industrial-grade power-coated paint. • Built-in Electric Cutter: The time-tested cutter from the LX2000e is used. LX910e is the fastest and highest print quality colour label printer ever developed by Primera. It utilizes an all-new, very high capacity thermal inkjet print head that was designed from the start to be unmatched in its performance. 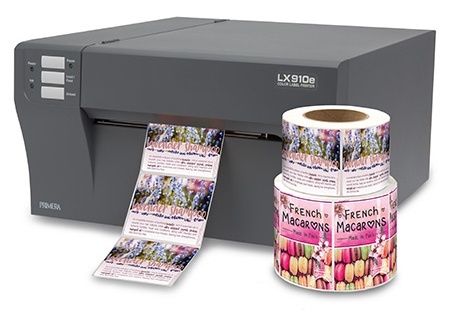 With LX910e you’ll quickly and easily get all the labels you need with professional print quality on each and every label, free of horizontal banding or streaks down the length of the output. With up to 114 mm (4.5”) per second print speeds, your labels will be produced quickly and efficiently. Print quality on LX910e is the best we’ve ever offered, and likely the best you’ll ever find. Dare to com-pare! Get identical samples from each printer you are considering. Selling your products is much easier when you have the most professional-looking labels! Print with dye-based ink for the most colourful and vibrant looking labels. Swap out the all-in-one ink cartridge in 2-3 seconds and print with pigment ink for the most durable inkjet labels. One Single Multi-Colour Ink Cartridge. The all-new, highly advanced ink technology used by LX910e is unique in the business. It requires only a single ink cartridge to produce incredible, best-in-class results. The secret is in the nozzles. Ink droplets are fired so precisely that there’s absolutely no need for a separate black ink cartridge. The resulting “process” black is exceptional. It also costs no more to use than dealing with an extra black ink cartridge. With LX910e, you’ve got just one ink SKU to keep track of – without compromising results. The LX910e comes with a powder coated metal enclosure which had been certified for many years in areas with higher safety regulations. Especially suitable for use in mechanical and plant engineering, or when electromagnetic screening (EMC) is required.